Developing tree breakage models is a key parameter in the modelling of forest yield. To model the height at which a stem breaks during harvesting and before log-making can start, allows for correct allocation of recoverable stem volume in which logs can be made from. This is one of the Biometric methods which are used to during the log-making process together with volume and taper models. Interpine have recently worked on the data collection methods for breakage model development. In the past collection of such data has been labor and time intensive, while also resulting in a very staged environment in which the study data is collected. Being that you are working closely alongside the harvesting machine operators and / or tree fellers. With the advent of drones in the industry, Interpine has reworked how these studies are conducted. 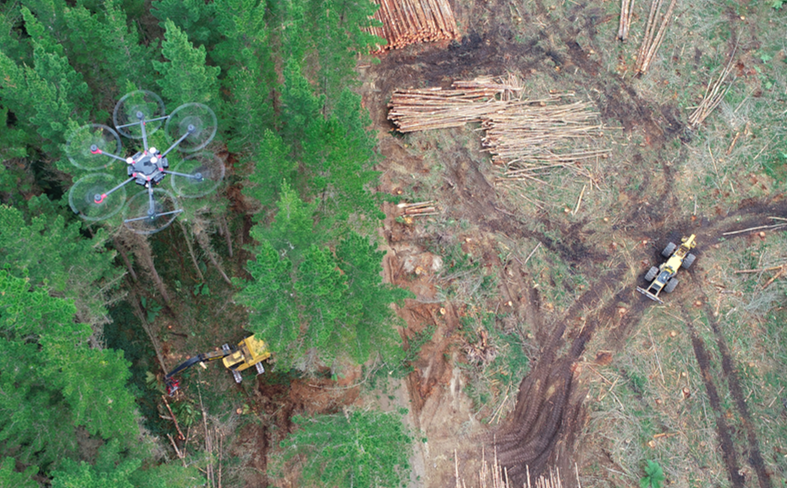 Remote access to work zone is managed safety with no people within operating area of the machine or tree feller, and with the drone operated remotely from 200m to 1km away. 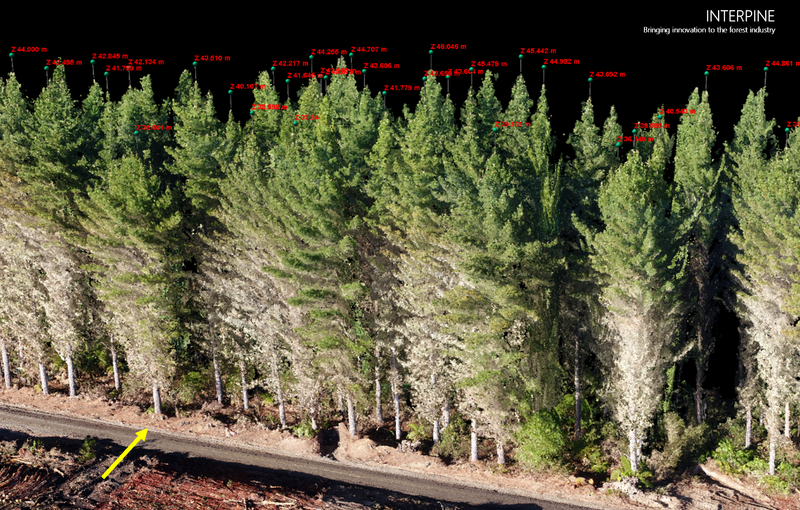 Here is a 3D model of a forest just prior to harvesting, using photogrammetry (structure from motion). While this is not LiDAR, photogrammetry with control, can provide valid datasets on exposed faces of trees for the harvesting studies to be conducted. They can also be compared with LiDAR datasets collected over the forest area is available, just with any updates in the canopy since the previous LiDAR. 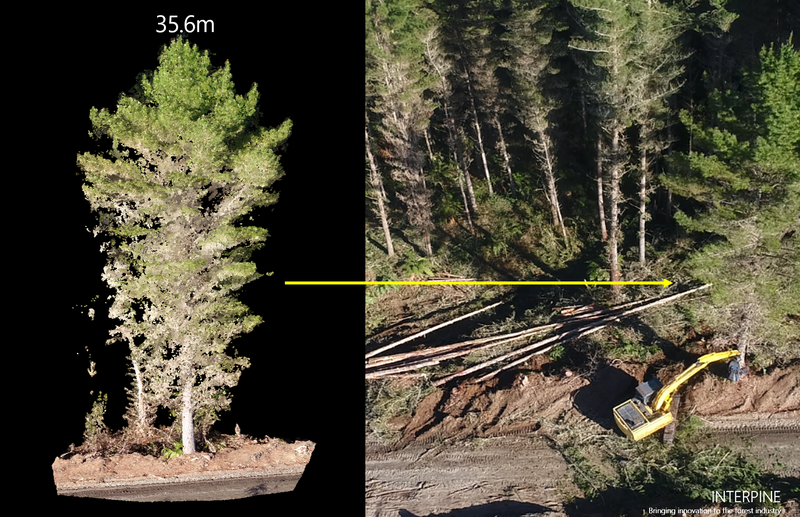 These data-sets can then be analysed for tree height, with trees extracted from the point cloud for later comparison to the breakage observed from video of the harvester working to fell the trees. The tree shown above can be seen being harvested in the following clip from the video. 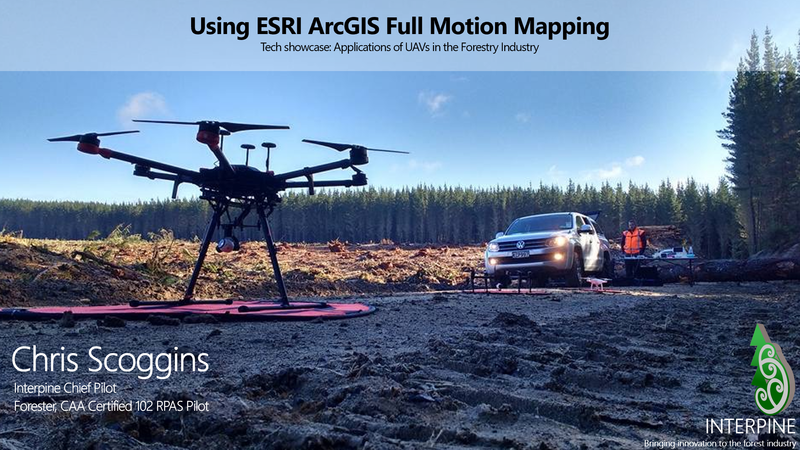 Using ESRI ArcGIS we can then use Full Motion Video (FMV) to monitor and measure the actual breakage of these trees during the harvesting process. Thus enabling the build up of detailed harvest breakage study data over time that will enhance and better represent current harvesting practices. This also allows for evaluation of changes in equipment types; for example fixed vs dangle head felling machines or any combination of techniques used to harvest and extract stems prior to log making. You can also use this same Full Motion Video technique for monitoring other parts of the harvesting cycle. In this example below the full stem extraction to the roadside. 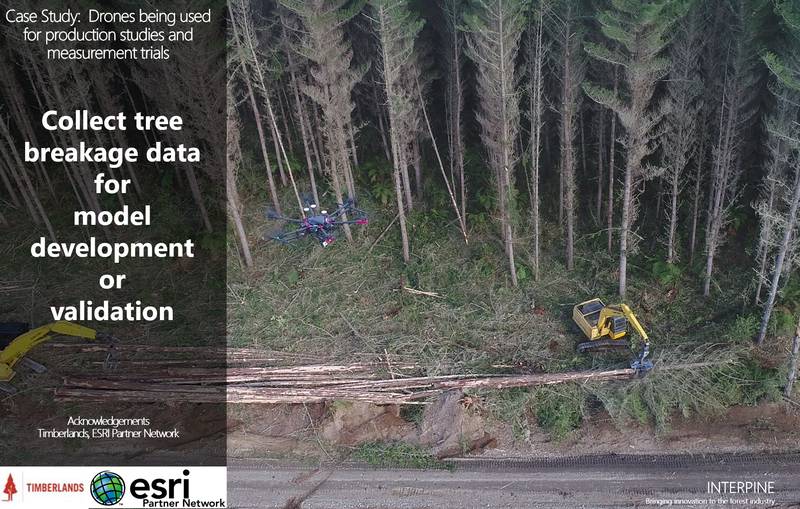 Interpine’s chief UAV pilot, Chris Scoggins profiled this service at ForestTech 2017, and Interpine have continued to deliver a range of harvesting breakage studies and improve the process over the last 12-18 months. If you would like to know more on developing and validating forest yield harvest breakage models, contact our team.